"I got this recipe from a former co-worker. It is so easy and so good! Makes a great potato topper as well! Serve with potato chips." 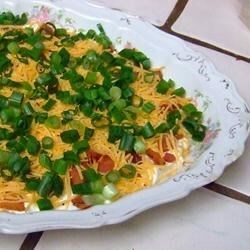 In a medium size mixing bowl, combine sour cream, bacon, Cheddar cheese and green onions; stir well. Refrigerate, or serve immediately. This dip is so addictive! Everyone just raved about it! I did make the chages some suggested: I added a packet of ranch dressing mix and I used real bacon. Thanks so much for a great recipe. I took this to a tailgate and it was a huge hit and so easy to make! I needed 2 bags of regular size Ruffles! Thanks for the great recipe! This was so easy and sooo good!! I made it for a party I had recenlty and it was a huge hit. Everyone asked for the recipe. I will keep this one around for a long time.